The Oshawa Generals unleashed an offensive onslaught against the Flint Firebirds to cap off a two game weekend. Backup goalie Aidan Hughes started in net for the Gens as they took on the Firebirds, and he was beaten by a shot in the bottom corner to start the scoring, as Flint took an early lead. However, the Gens recovered with a shot in the top corner by Kyle MacLean, his 11th of the season, to tie the game. The first period ended with the game tied, despite the Gens outshooting the Firebirds 14-6. Flint came out of the gate strong in the second, with Kyle Harris scoring 2:25 into the period. This was followed by a goal just under 10 minutes later by Jake Durham, giving the Firebirds a 3-1 lead. However, Oshawa was quick to answer as Brandon Saigeon brought them back to within one less than a minute later. The second period ended with the Gens down 3-2, and outshooting their opponent 24-18. Heading into the third, the Gens acted quickly to begin their comeback, as Anthony Salinitri buried one off a wrist shot to tie the game. A goal from Brett Neumann quickly followed as he put one through the five-hole of Flint goalie Luke Cavallin. Another quick goal followed off the stick of Tyler Tullio as he netted a shot in the top corner to further add to the Gens lead. All three goals were scored in just over two minutes. Salinitri would then add another goal as he potted a one-timer from the right side of the net. Flint then showed some late life however as Eric Uba scored to make it 6-4. But, just under a minute and a half later, Serron Noel further added to the Gens lead when he tipped a point shot from Nicolas Mattinen past Cavallin. The Gens would then add one more as Salinitri would complete another hat trick, this time a natural hat trick, by going in alone. He now has 34 goals this season, and 20 goals in 20 games since coming to Oshawa. The Gens finished the game with an 8-4 victory over the Flint Firebirds, who they outshot 42-27. The Gens capped off the game with a six goal third period, and also went two-for-two on the powerplay. The Gens claimed all three stars of the game, as Salinitri was named the first star after getting a hat trick and an assist, Tullio was the second star after getting a goal and two assists, and Saigeon was named the third star with a goal and an assist. In earlier action, the Gens took on the lowly Kingston Frontenacs, who they had beaten three times in five games this season. After a scoreless first period where neither team had many chances, the Gens opened the scoring in the second as Nando Eggenberger wristed one past goalie Brendan Bonello, his 15th of the season. Neumann followed as he tipped a point shot from Giovanni Vallati past Bonello. Salinitri then added to the Gens lead when he weaved his way past Kingston’s defenders and backhanded one past Bonello. The second period ended with the Gens taking a commanding 3-0 lead. Just over seven minutes into the third period, Tullio picked up where his team left off as he snuck one past Bonello to give the Gens a 4-0 lead. However, former General Nick Wong got some revenge on his old team as he scored for Kingston, breaking the shutout. However, the Gens were quick to respond as only three minutes later Salintri netted another from right in front of the net for his second of the game. Finally, after some tic-tac-toe in front of the net, Eggenberger potted his second of the game to make the score 6-1 in favour of the Gens. After trading chances in the dying minutes of the third, the game would end with the Gens taking the commanding victory over the Frontenacs. The Gens have now won four of six games against Kingston this season. Oshawa controlled the puck as they outshot their opponent by a margin of 43-15. The Gens took all three stars of the game as Salinitri was named the first star after scoring two goals, Neumann was the second star with a goal and an assist, and Allan McShane was named the third star after getting three assists. 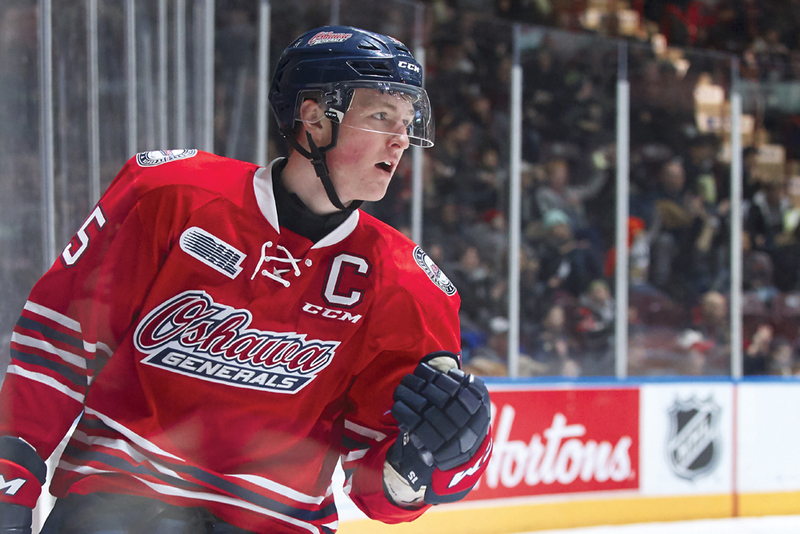 Over the weekend, the Gens outscored their opponents 14-5 in two games, while also outshooting them 85-42. The Gens will play a home and home against the first place Ottawa 67’s starting on Friday in Oshawa, then in Ottawa the next day. They will then take on the London Knights at home on Sunday at 6:05 p.m.